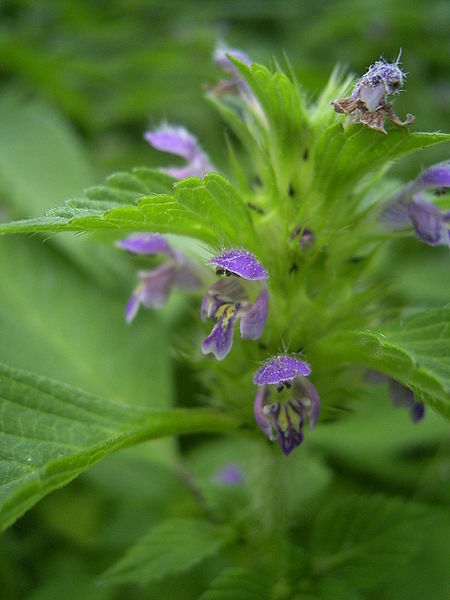 Galeopsis tetrahit (Common Hemp-nettle) is in the family Laminaceae, native to Europe and northwestern Asia. It is a wild herbaceous annual growing to 1 m tall; it is a pioneer species that thrives on disturbed sites or roadsides. Once the ground is covered by perennial plants these pioneer species can't compete and disappear. However, if you clear the ground again by covering with black plastic, old carpet, cardboard etc., the seeds in the soil from a previous year will germinate again when you uncover after a few months. The stem of Hemp Nettle is square, like all the mint family, but the leaves are nettle-like (though they don't sting, the seed pods are prickly) and the flowers are pink or purple, diminutive, bilateral and snapdragon-like. The flowers are fantastically attractive to all kinds of bees.